Readers Question: What is the importance of bank lending to the UK economy? Bank lending plays an important role in influencing levels of consumer spending, investment and economic growth. When bank lending reduced at the start of the credit crunch in 2008 – this decline in bank lending was a significant factor in causing the 2008 recession. 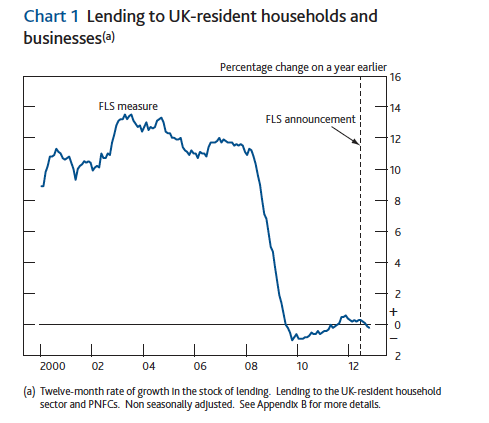 This graph shows that lending to UK households and business was growing rapidly during the period 2000-2008. However, the credit crunch caused a precipitous fall in the growth of bank lending. Bank lending fell from growth of +10% to negative growth during 2010 and 2011. This fall in bank lending led to lower economic growth. The credit crunch made it difficult for banks to borrow money. Because banks were short of cash (liquidity) themselves, they weren’t able to lend to firms and consumers. Many small firms have complained they would like to invest, but have been unable to get a loan from traditional banks. Bank Balance Sheets. In the run up to the credit crunch, banks were increasing the amount of lending. Often they lent money to risky projects on the expectation of continued economic growth. By 2008, banks were short of cash because they had been too willing to lend. Since 2008, banks have been trying to improve their balance sheets by attracting savings and reducing the amount they lend. Less Demand for loans. After the credit crunch hit, consumers became more reluctant to borrow and spend, leading to less demand for loans. Also, some firms were put off investing by the recession because if output falls, investment becomes less attractive. Impact of a Fall in Bank Lending on the Economy. 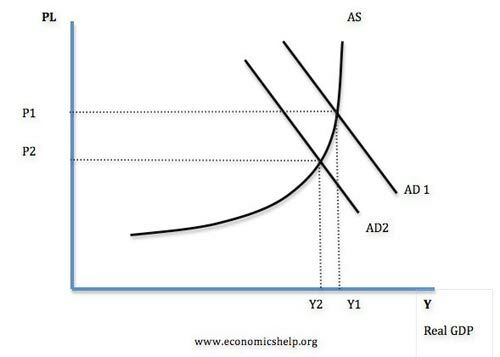 Diagram showing a fall in AD as a result of lower investment and consumer spending. With lower levels of bank lending, firms were not able to borrow to finance investment. Therefore, investment in the economy fell considerably. 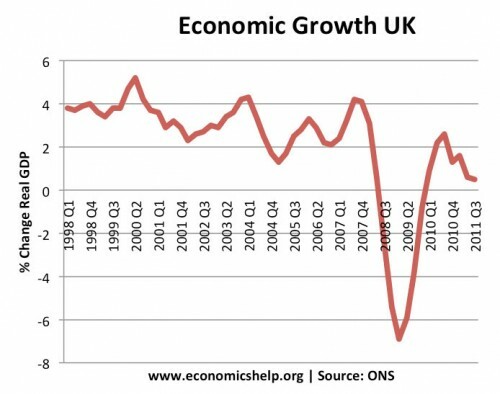 Investment is a component of aggregate demand (about 16%), so the reduction in investment reduced overall demand and was a factor in reducing economic growth in the UK. Negative Multiplier Effect. With a fall in investment, there can be a knock on effect to other areas of the economy. If firms cut back on investment, this will cause some unemployment, and therefore the unemployed will spend less – causing an even bigger fall in economic growth. With lower bank lending, consumer spending is also affected. It is harder for consumers to finance spending on items such as cars and holidays. Lower mortgage lending particularly hurt first time buyers who struggled to get a deposit. As a result the proportion of people renting a house in the UK has increased. Increase in the saving ratios. With lower bank lending and other factors, the saving rate in the UK has increased since 2008. Impact on aggregate supply (LRAS) in the long run. Lower bank lending leads to lower investment. In the short term, this is primarily seen through lower aggregate demand. But, if investment is curtailed for a lengthy period, it means that we are not investing in future productive capacity – therefore there will be slower growth in Long run aggregate supply. The long decline in bank lending and investment has hit the UK’s long run trend rate and reduced future economic growth. The impact of a fall in bank lending also depends on other factors in the economy. Because the fall in bank lending occurred at the same time as a European wide recession, UK exports were also under pressure. The impact of a fall in bank lending may have been greater, if interest rates hadn’t been cut. The cut in interest rates to 0.5% in 2009, helped people to afford the interest payments on bank loans; lower interest rates made mortgage payments cheaper, helping to maintain consumer spending. The fall in bank lending and negative news about the state of the banking system caused a big fall in consumer confidence. This fall in consumer confidence contributed to the decline in spending and economic growth. “although bank and building society lending to individuals had shrunk by 23% (£34bn) since 2007, lending by alternative consumer credit providers had risen by 42% (£29bn) over the same period.” BBC – In other words consumers have been switching to much higher interest rates on payday loans. This entry was posted in A-Level and tagged a-level, investment. Bookmark the permalink.